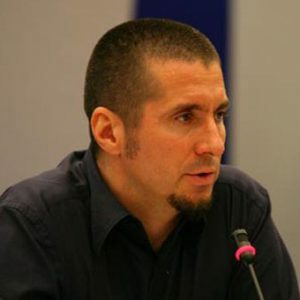 Dimitris Charitos is an Associate Professor in the Department of Communication and Media Studies at the National and Kapodistrian University of Athens, where he teaches human-machine communication, interactive design, digital art and visual communication. He studied Architecture at the National Technical University of Athens, and C.A.A.D. in the Department of Architecture, University of Strathclyde (Glasgow). He holds a PhD in interactive and virtual environments design. His artistic practice includes electronic music, audiovisual and interactive installations and virtual environments. He has participated in exhibitions in Greece, the UK and Cyprus. As a researcher or coordinator, he has participated in research projects (funded by Greek and European programs) on the subjects of virtual reality, locative media, digital art and multimedia.